Chic in the concrete jungle! With every fashion week season comes street style –as this week it’s the turn of the city that never sleeps to show us how it’s done! The best dressed fashion-goers have been spotted in NYC wearing an array of prints, a series of ugly trainers, comfy knits and standout summery shades that we’ll be taking into autumn. The occasion is, of course, New York Fashion Week. 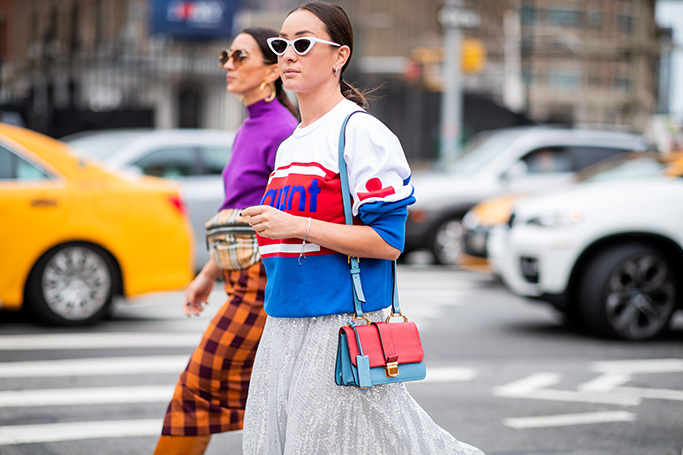 Whilst the runway is revealing the Spring/Summer 19 trends, the streets of New York have been serving us with inspiration on how to dress for the season ahead. Take note of logo-mania, the best of boots and bags as cute as the boxy Rejina Pyo Olivia tote.